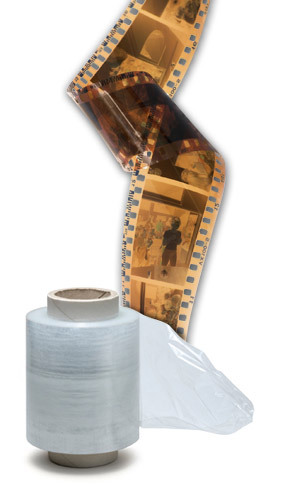 There are multiple points in plastic films manufacturing where coating thickness is critical to quality. These include: total film thickness (up to 1mm), Coextrusion sub-layer thickness, and the thickness of coatings on a film web. In the particular case of coatings on PET, our F20-UV can measure very thin layers (~10 nm) and even energetic plasma surface treatments. Our standard F20 can measure ubiquitous coatings such as hardcoats in the 0.05 to 50µm range. We have an extensive refractive index database for a range of polymer films including PET, polycarbonate, cellulosics, and polyolefins, as well as more exotic materials such as conductive polymers. Each of these applications offers a unique set of challenges, and Filmetrics has developed the software, hardware, and applications knowledge to deliver the right solution. 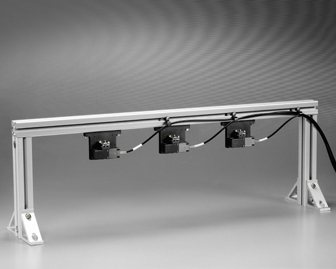 For web inspection and general polymer film measurement, contact our thin-film experts. 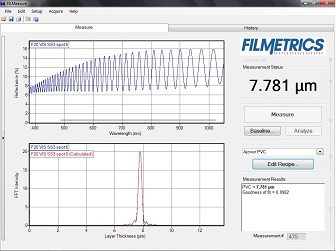 Thickness was measured using our F20 with the 200µm small-spot fiber. Thickness measurements of the extruded plastic films of Polyvinyl chloride (PVC) were measured real time with the inline setup and the tabletop setup. For tabletop measurements, the SS-3 standard stage was used to make single, spot-to-spot measurements. For the inline measurements, a lens and RKM were used to make measurements real time as the web was moving. 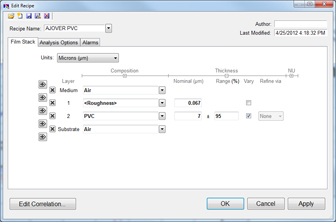 With the use of our extensive refractive index database, the PVC thickness was easily measured. The F20 can also be used to measure thicknesses of co-extruded films as well as coating thicknesses on various materials such as PET.